"The Town" finds Doug MacRay (Ben Affleck) leading of one of Boston's more successful and audacious gangs, a trade he learned from his old man. Despite having been raised In the streets of Charlestown, where robbing banks is a way of life, Doug begins to contemplate making some changes. 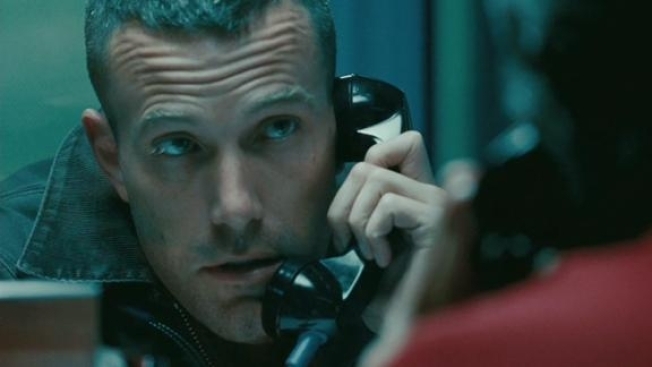 In addition to starring, Affleck also directed and co-wrote the film. He performs all three jobs ably, but doesn't really shine in any of them. The film has difficulty finding the tone that it wants, vacillating from gritty crime caper to spiritual journey, without convincingly intertwining the two. At the center of this problem is Affleck's Doug MacRay, about whom we know quite a bit, but somehow not enough. It's clear that Doug isn't like the other kids, but what it is that sets him apart is unclear-- absent parents and substance abuse are hardly unique in the world he's from. Though Affleck has trouble pinning down the feel of his film and his heists don't exactly crackle, his direction shows a strong sense of humor and wit throughout, his attention to detail about life in Boston is impeccable and he does a nice job choreographing his car chases (about that car chase, as fun as it is to watch, only a total moron would plan to rob a bank in Boston's noptoriously unnavigable North End and try to escape by car. Honestly, it's beyond stupid). Jeremy Renner and Blake Lively both give standout performances as Jem, the best friend from childhood and trigger-happy hothead, and Krista, the ex girlfriend who won't let go. Renner again shows the intensity that made him so good in "The Hurt Locker," while adding a touch of irrational rage and great comic timing. Lively's part is largely a stock character, the white-trash junkie ex, but she plays it convincingly. And both deal with the Boston accent without embarrassing themselves. Rebecca Hall is her usual excellent self, as are Chris Cooper and Pete Postlethwaite. Jon Hamm as a tough-talking federal cop just doesn't quite work, whether it's the shadow of Don Draper or the man's innate being, is uncertain, but there it is. Ultimately, "The Town" is the grit of "Heat" combined with the schmaltz/heart of "The Shawshank Redemption," without quite reaching the heights of either. It's an enjoyable genre film, but not much more than that.